1Cholayil Private Limited, R&D Centre, Chennai, India. Acne vulgaris is one of the most common skin disorders in youth especially during the puberty. It is a chronic inflammatory disorder of pilosebaceous follicles that affects more than 85 percent of adolescents and young adults. Body odor is caused by apocrine, eccrine and sebaceous glands which generate fluids and chemical substances. Although sweating plays an important role, the classic association of sweat and body odor is only part of the explanation. It is true that unwanted body odor, occurring mainly in the axilla and the feet, is only indirectly caused by the secreted sweat but It is actually caused by bacteria living on the skin which find ideal conditions for growth in the warm areas of the body that tend to stay moist. They metabolize certain compounds found in sweat, leading to the occurrence of unwanted body odor . Loss of color or hypopigmentation is common to all races and occurs in disorders such as the poorly understood vitiligo. This effect, unsightly in white skins, can be devastating in black skins. Darkening of the skin or hyperpigmentation, again occurring in all races, can be a particular problem for black women as a result of hormonal changes during pregnancy, or the use of the contraceptive pills. Both darkening and lightening of the skin can occur as the horny layer of the skin heals after the damage caused, for example, by spots and rashes. Sometimes there is a chance of hyper pigmentation caused by Malassezial infection. These organisms may produce a compound called azelaic acid resulting in pityriasis versicolor. Poor Complexion, even though is not a skin problem, where the color of the skin is due to the existence of pigment bodies known as melanin. Melanin is produced by melanocytes present in the basal layer. The color of the skin is determined by the amount and type of melanin produced. This study was planned to evaluate the antimicrobial activity, safety and efficacy of Medimix bathing bar with Sandal and Eladi oil. This study was a prospective, a single center, open label study to evaluate the safety, efficacy of the soap bar conducted on 35 volunteers, at the department of Dermatology of The Apollo hospitals, Chennai, India, as per the ethical guidelines of Declaration of Helsinki, during May 2007. The study protocol, case report forms, regulatory clearance documents, product related information and informed consent form were submitted to the "Institutional Ethics committee" and were approved. A total of 35 consented volunteers were screened by the Principal investigator as per the protocol criteria like, males or females above 18 years of age, able to consent and volunteered for this study. Volunteers with boils/ acne in the body, skin irritation, skin allergy and rashes, hypersensitivity to normal vegetable oil (Coconut oil) and who were under medical treatment for skin infection were excluded from the study. A baseline history was obtained in order to determine the patient's eligibility for enrolment in the trial. 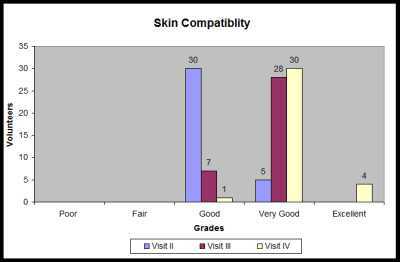 The baseline assessment included personal data, a description of symptoms and details of past medical history like rough/oily/dry skin, acne, pigmentation, photosensitivity, itching/irritation, boils/scars, use of any medication and infection, blemishes, eczema, body odor, worm infestation, allergy, itching, constipation, stress/mental fatigue (condition characterized by excessive mental tiredness), hepatitis/viral Infection, cracks, dandruff and any other complaint. All the volunteers were provided with Medimix soap with Sandal and Eladi oil required for a period of 1 month and were under examination a weekly follow up visits, to check the improvement in all the respective parameters. Any volunteer who develops any adverse reactions or clinically significant abnormal laboratory tests values was evaluated by the Principle investigator and will be treated and / or followed up until the symptoms or values return to normal or acceptable levels as judged by the investigators. All adverse experiences will be documented in the case report form as well as in the volunteer's case file. A total of 35 volunteers included in this study were in the age range of 18-35 years. The results are given in the Figure (1-13). 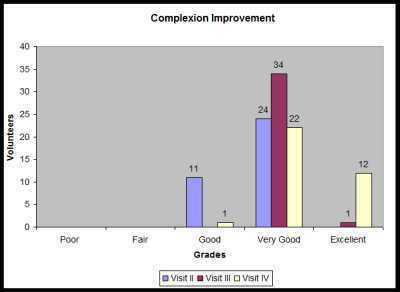 Very good complexion promotion was perceived by 24 volunteers from 2nd week and 34 volunteers from 3rd week and excellent complexion promotion was rated by 12 volunteers at the end of 4th week (Fig 2). Very good moisturizing effect was noticed in 16 volunteers during the 2nd week, all 35 volunteers by the 3rd week and 21 volunteers by the 4th week. Fourteen volunteers rated as excellent by 4th week (Fig 3). Eighteen volunteers perceived very good reduction in dryness by the 2nd week, 33 volunteers by the 3rd week and 22 volunteers by the 4th week. 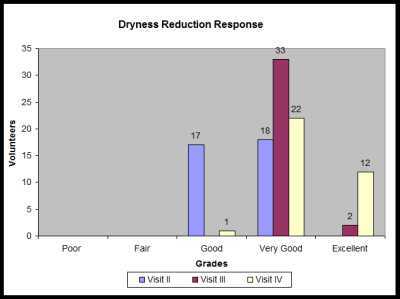 Twelve volunteers have rated excellent reduction in dryness by the 4th week (Fig 4). 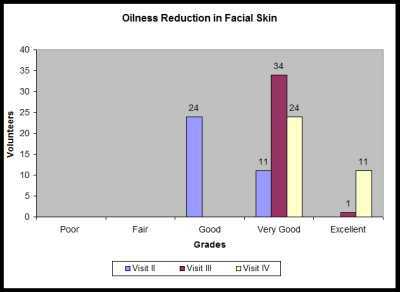 Very good reduction in oiliness was noted by 34 volunteers by the 3rd week while excellent reduction in oiliness was rated by 11 volunteers by the 4th week. (Fig 5). 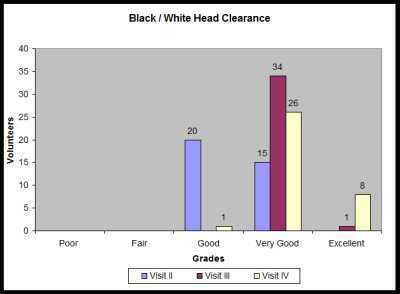 Black/white heads clearance was observed very good in 34 volunteers by the 3rd week. 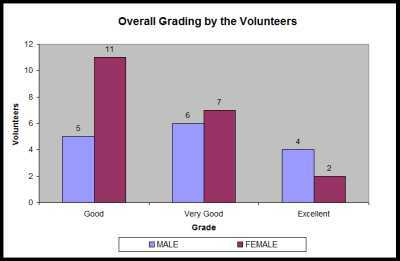 The 4th week rating ranged from very good to excellent in 35 volunteers (Fig 6). 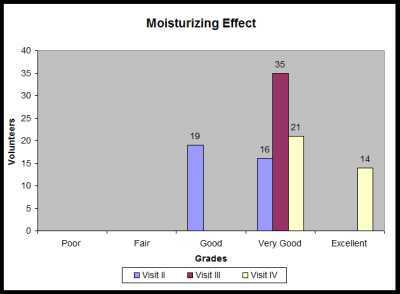 Soothing and smoothening effect was very good by the 3rd week and was rated as excellent by 14 volunteers during the 4th week (Fig 7). 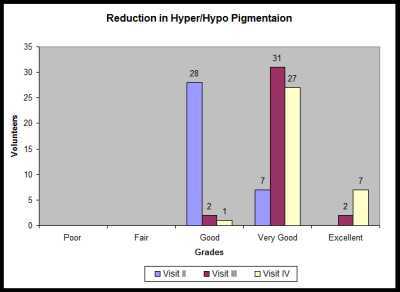 Hyper/hypopigmentation reduction was rated as very good in 31 volunteers during the 3rd week and 7 volunteers rated excellent during the 4th week (Fig 8). 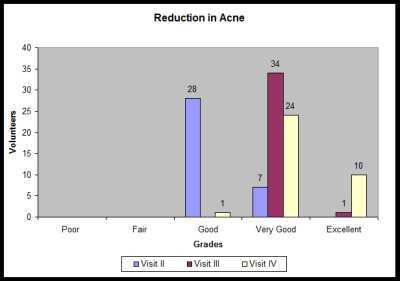 Very good acne reduction was observed in 34 volunteers during their 3rd week and excellent reduction perceived by 10 volunteers during the 4th week (Fig 9). 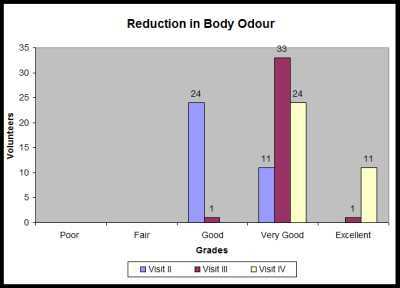 Very good reduction of body odor was observed by 33 volunteers by the 2nd week and excellent reduction perceived by 11 volunteers by the 4th week (Fig 10). Cleansing effect was perceived by 34 volunteers from the 3rd week rating as very good and 11 volunteers as excellent from the 4th week (Fig 11). 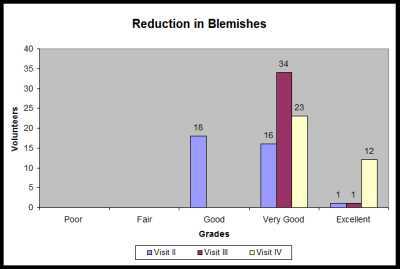 Blemishes reduction was observed as excellent by 12 volunteers from the 4th week (Fig 12). Minimum inhibitory concentration of bathing bar was found to be 1.25 mg/ml against Malassezia furfur and Candida albicans. The MIC against bacterial cultures Staphylococcus aureus and Micrococcus species was at 1.25 mg/ml and against Staphylococcus epidermidis and Corynebacterium diphtheriae was at 2.5 mg/ml (Table 1). As per the trial the overall performance of bathing bar rated by volunteers grading 46 % as good, 37 % as very good and 17 % was excellent (Fig 13). We would like to thank cordially our Managing Directors, Mr. Pradeep Cholayil and Mrs. Jayadevi Pradeep, Cholayil Private Limited, 31A/24, SIDCO Industrial Estate, North Phase, Ambattur, Chennai, Tamil Nadu, India for their support to carry out this project and thank the Team, Apollo hospitals where the clinical trials were carried out. 1. Smits J., Senti B., Herbst N. us Neo TM-a Naturally effective Deodorant and Antibacterial active. Cosmetic Science Technology. 2012.1-8. 2. Mwambete K D. and F Lyombe. Antimicrobial activity of medicated soaps commonly used by Dar es Salaam residents in Tanzania. Indian J Pharm Sci. 2011.73:92-98. 3. Nishteswar.K and Vidyanath R. Sahasrayogam. Chowkhamba Krishnadas academy, Varanasi, Third edition. 2011.P-124-125. 4. William Butron and Joel Gaikwad. An in vitro analysis of the efficacy of selected bar soaps as antibacterial agents. 2009.Bios. 80: 66-79. 5. Saba Riaz, Adeel Ahmed and Shahida Hasnain. Antibacterial activity of soaps against daily encountered bacteria. African Journal of Biotechnology. 2009.8: 1431-1436. 6. Ashbee Ruth H and Glyn E Evans V. Immunology of diseases associated with Malassezia spp. Clinical Microbiology reviews. 2002. 15: 21-57.